Dubai, UAE, 21 January 2018: LG Electronics (LG) has announced that its UltraFine 5K display catered to Apple users to solve issues of compatibility between the Mac and external displays will be available in the Gulf region in January 2018. Boasting exceptional features for the finest details, LG is striving for excellence whilst empowering Mac users who desire high definition quality with superior visual and audio capabilities of a MacBook or MacBook Pro. The UltraFine 5K features several ground-breaking components, and is namely the world’s first 5K display with a Thunderbolt 3 port that can transmit 5K video and data whilst simultaneously charging a MacBook Pro up to 85W with just one single cable. 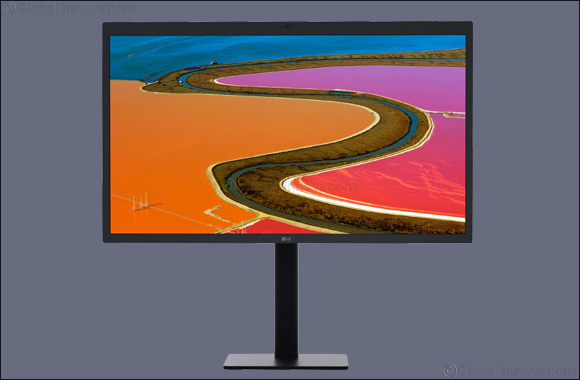 Furthermore, the display allows users to connect to several additional devices with its three USB-C downstream ports located at the back of the monitor. Displaying a brightness of 500cd/m2, the 5K display is at 218 pixel per inch, illustrating an array of color and contrast at the fascinating resolution of 5120x2880. It makes for an ideal choice for creative users who desire a true representation of nature in a visual image as well as those who want to view images in their most accurate form. The most genuine visuals are revealed through the In-Plane Switching, or IPS, that provides a flawless visual output and consistency in color from all edges and angles. Furthermore, the 5K display is great for leisure as it provides an internal webcam and speaker that enable users to enjoy watching film, making speakerphone calls and chatting with others through exceptional visual and sound quality. LG’s advancements in display technology are at the forefront of the technology industry, proving to benefit users with different objectives and needs by facilitating their experience and bringing about new solutions for creativity and imagination. With every innovation, LG is providing its users better audio and visual elements at pace with the large-scale enhancements they are making happen.